He was the son of 'Amru` b. Huzam al-Ansa`ri al-Khazraji. He was a prominent companion of Hazrat imam Ba`qir a.s. He was among the excellent Moslems. He devoted his life to the members of the House (ahl al-Bayt a.s), peace be on them. He was the last survival Companion of the Prophet s.a.w, may Allah bless him and his family. Abu` al-Zubayr al-Makki reported on his authority. He said: "I asked Ja`bir b. 'Abd Allah about 'Ali b. Abi Ta`lib a.s. So, he raised his eye brows from his eyes, and then he said: 'He was the best of all mankind. By Allah, during the lifetime of Allah's Apostle s.a.w, we knew the hypocrites through their detest towards him. Ja`bir a.s loved the Commander of the faithful, peace be on him, very much. So, he leant on his rod and walked through the streets of Medina. He said: "'Ali a.s is the best of all mankind. Whoever denies that is unbeliever. O People of Ansa`r, educate your children to love 'Ali a.s."
'Therefore, say it,' they demanded. 'Allah has revealed these Words of His: 'Say I demand not, of you any reward for it (the toils of preaching) except the love of my relations.' 'This is the best right,' they said" Then Abu` 'Abd Allah (al-Sa`diq), peace be on him, said: "By Allah, no one was loyal to this right except seven persons. They are Salma`n, Abu` Dharr, 'Amma`r, al-Muqdad b. al-Aswad, Ja`bir b. 'Abd Allah al-Ansa`ri, the retainer of Allah's Apostle (may Allah bless him and his family), and Zayd b. Arqam. Harat Ja`bir a.s took part in eighteen campaigns headed by the Prophet, may Allah bless him and his family. He took part in the Battle of Siffin headed by the Commander of the faithful, peace be on him. It was he who recited the greetings of the Prophet, may Allah bless him and his family, to Ima`m al-Baqir a.s. The Prophet, may Allah bless him and his family, asked Allah twenty-five times to forgive Ja`bir. 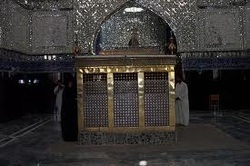 Ja`bir held a seminar of knowledge in the mosque.He died at the age of ninty-four.